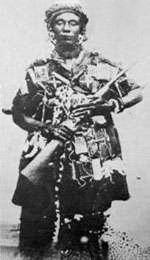 Yaa Asantewaa was the queen mother of the Edweso tribe of the Asante (Ashanti) in what is modern Ghana. She was an exceptionally brave fighter who, in March 1900, raised and led an army of thousands against the British colonial forces in Ghana and their efforts to subjugate the Asante and seize the Golden Stool, the Asante nation’s spiritual symbol of unity and sovereignty. Yaa Asantewaa mobilized the Asante troops and for three months laid siege to the British fort of Kumasi. The British colonizers had to bring in several thousand troops and artillery to break the siege, exiling Queen Yaa Asantewaa and 15 of her closest advisers to the Seychelles. She lived in exile until her death in October 1921. Yaa Asantewaa’s War, as it is presently known in Ghana, was one of the last major wars on the continent of Africa to be led by a woman.